The Electronic Visions EV420 is an H-line system with double-sided mask alignment capabilities. The current configuration uses 5" x 5" x 0.09" masks and 4" wafers up to 3mm thick. This mask aligner is also equipment with wedge error compensation (WEC) for better planarity between the mask and the wafer surface. The top side alignment 4X objectives can be changed to a higher magnification for more precise alignment. The following parameters can be changed: exposure time, side of alignment, separation gap of 6-130µm, proximity gap of 6-130µm, and process type (exposure or bonding). Exposure settings can be soft contact, vacuum contact, hard contact or proximity. The illumination uniformity for a 4 inch wafer is better than ±3%. The EV420 mask aligner has a bond option using a special bonding chuck. 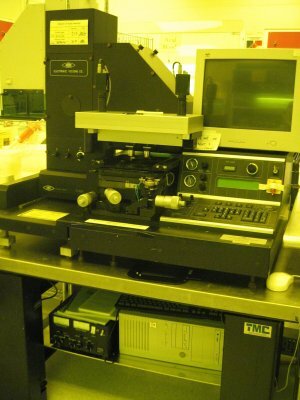 The bonding chuck allows for silicon direct bonding, or the bonding chuck can be removed and transferred to the EV501 bonder for anodic bonding.